Baron Emmanuel de Graffenried in a Maserati 4CLT/48 at Silverstone, May 1949. Homepage. This page: De Graffenried is illustrated 'at work', behind the wheel of a 4CLT/48 Maserati. A Maserati features on the Eagle comic, 2nd March 1963. The Eagle comic of the 1950s and 1960s is perhaps best remembered for the inter-galactic adventures of Dan Dare - Pilot of The Future, ably assisted by his sidekick Digby and the remainder of Space Fleet. 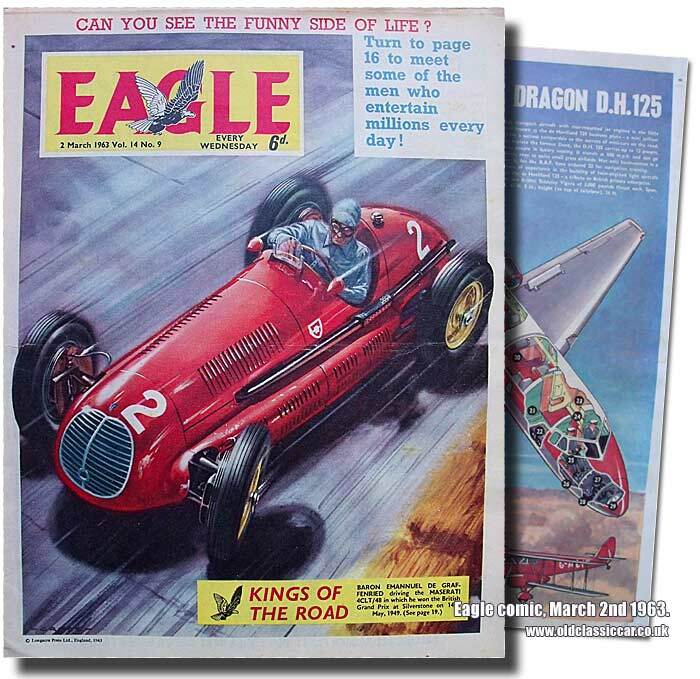 Compared to space travel and inter-planetary exploration and adventure, perhaps a four-cylinder petrol-engined car appearing on the cover of this Eagle comic might appear to be rather dull by comparison. However as the car in question is a Maserati 4CLT, driven to a win at the British Grand Prix in May 1949 by Baron Emmanuel de Graffenried, then perhaps it isn't so un-captivating after all. [A period shot of a 4CLT being driven by privateer Leslie Brooke can be found on this page of the site, while two photographs of Villoresi in a similar car at the 1948 Jersey Road Races, can be seen here]. The illustration, from a high vantage point, has de Graffenried hustling the two-stage-supercharged four-cylinder Maserati around the fast and flowing Northamptonshire circuit in 1949, only the second year that official racing had taken place at the former airfield site. He averaged 77.3 mph to win that race, taking the chequered flag ahead of Bob Gerard (ERA) and Louis Rosier (Talbot-Lago). Quite why this particular race win was celebrated on the cover of a 1963 Eagle comic, some fourteen years almost since it took place, I'm not quite sure, perhaps it was one of a series of historic motor racing scenes to be featured in this way? Despite the eye-catching cover, only one-quarter of page nineteen is dedicated to the Maserati and its driver, where a brief history of de Graffenried's exploits behind the wheel of various racing cars is given, prior to his retirement in Switzerland. "Toulo" de Graffenried began racing as a career in 1936, in his own 1.5 litre Maserati. In the post-war years he'd be a regular entrant behind the wheel of different Maseratis, plus the occasional Alfa Romeo, rounding out his Grand Prix career in a 250F at Monza in 1956. The 4CL, 4CLT and 4CLT/48. The four-valve-per-cylinder 1,498cc 4CL, with a single-stage Roots supercharger, made its debut - at Brooklands - in 1939. In this initial form it produced 210bhp. Interesting features of the car included a large chassis crossmember that doubled as an oil tank beneath the driver, and the fitment of torsion bar front suspension. The steering box was unusual too, in that it was located behind the engine, connecting to the front wheels by separate linkages, one either side of the car. The 4CLT of 1947 did away with the channel chassis of the 4CL, replacing it with a tubular type instead. The engine now featured two-stage supercharging, raising the quoted power output to 225bhp. Further engine work under the guidance of Signor Orsi (following the departure of the Maserati brothers to O.S.C.A.) saw this figure upped to 240bhp at 7,000rpm, when installed under the bonnet of the coil-sprung 4CLT/48, which made its first appearance at the San Remo race in June 1948, finishing first and second. Further successes would follow, but bids to increase the engine's power output - often by raising supercharger pressure - led to increased unreliability and regular DNF's being chalked up against those Maseratis competing. The dimensions of the 4CLT/48 were as follows: Wheelbase 8ft 2.5ins; front track 3t 11.5ins; rear track 4ft 1.5ins. There are few other items relating to transportation in this copy of the Eagle, the majority of the paper taken up with fictional stories. One of these though, titled Runway 13 (part seven of), revolves around a number of mysterious aircraft crashes that had taken place at an airstrip. Two-wheeler fans might have been interested in a half-page advertisement for a Smiths bicycle speedometer - "your friends will crowd round to admire it on your cycle" - while a comic strip, titled "XYZ Cars - Calling U for Useless", a skit on TV series Z-Cars perhaps, sees two coppers flatten their car by removing a stone used to "brake" an un-manned steamroller at the top of a steep hill, with predictable consequences. An article discussing what it takes to become a cartoonist, and a cartoon strip titled "Fidosaurus", draw the comic's contents to a close. The rear cover features a cutaway drawing of a De Havilland DH125 jet, also referred to as the Dragon - harking back to the original DH84 Dragon of 1932, an illustration of which is also included. Return to the Motoring Collectables section for more early motoring literature, including a number of other old comics that feature motor racing scenes on their covers. Several pages featuring early children's books, all of which have motoring scenes on their covers, can be found in this corner of the site also.